1. Using an electric mixer, mix cream butter and sugar together until smooth. 2. Add egg and vanilla and mix well. 3. Then add flour and salt and mix until incorporated. 6. Use 4 inch ring molds to make the tart shells and roll out into 1/8 inch thick circles. 7. Dock the bottom of the tart shells by piercing the bottom of the dough with a fork several times. 1. In a small saucepan, melt butter and then add brown sugar to dissolve. 2. Once dissolved add pineapples and vanilla bean and sauté until pineapples are softened. 3. Add coconut rum and flambé. 4. Remove from heat, cool and set aside. 1. In a small saucepan, melt butter then add sugar to dissolve. 2. Once dissolved add chocolate and stir until incorporated. 3. In a separate small saucepan, bring Carmelized Pineapple to a boil. 4. Slowly temper in eggs and heat until mixture thickens slightly. 5. In a mixing bowl, whisk together both mixtures. 6. Once you have chocolate ganache, carmelized pineapples and tart shell prepared you can begin to assemble your tart shells. 7. Add 1 tbsp. of the cooled sautéed pineapples on the bottom of the tart shell. 8. Pipe ganache while still warm on top. 9. Tap slightly to remove air bubbles and create a smooth even finish. Allow ganache to set before serving. 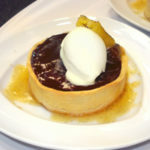 Serve tart with coconut sorbet and passion fruit sauce.